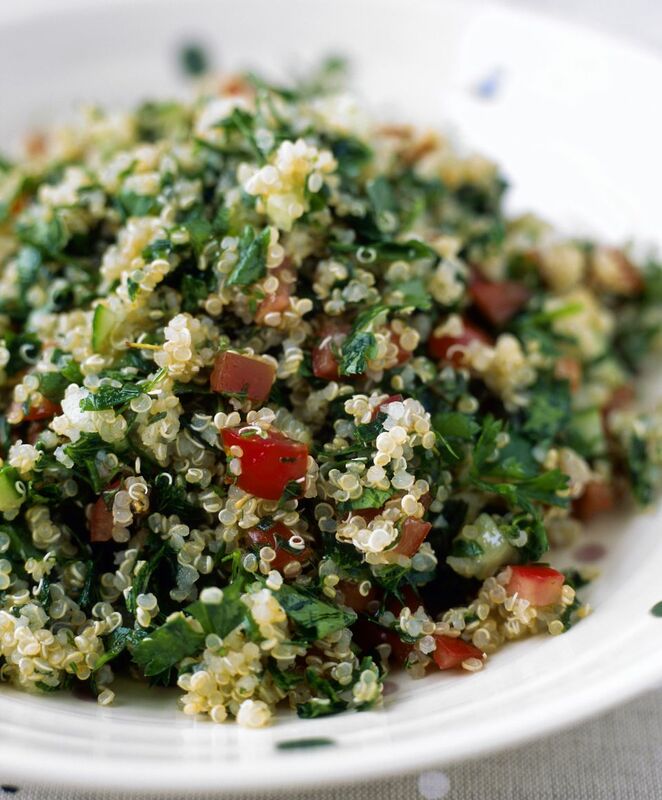 This gluten-free and vegan quinoa tabouli salad (also spelled tabouleh or tabbouleh) salad is made with healthy, whole grain and high-protein quinoa instead of the bulgur wheat which is traditionally used in tabouli recipes. It's really a two-in-one: you get a quinoa salad as well as a traditional Middle Eastern tabouli, and all of the ingredients are vegetarian and vegan as well as gluten-free, so it's perfect just about any diet or food sensitivity. If you like quinoa, you might want to branch out and try some other whole grains, too, such as kaniwa, millet, and teff. Whole grains such as these are versatile, and, if you buy them in bulk, they're a bargain. Meanwhile, while the quinoa is either cooking or cooling, in a large bowl, combine the chopped tomatoes, chopped cucumbers, scallions, garlic, fresh mint, and fresh parsley. Once the quinoa has mostly cooled (it can be warm still, but it shouldn't be hot) add the cooked quinoa, olive oil, lemon juice, and salt, tossing gently to combine well. Season with sea salt or kosher salt, to taste. Chill your quinoa tabouli salad for at least 1 hour before serving, preferably overnight, to allow the flavors to mingle and fully develop. Lightly toss it all together again just before serving. Give this quinoa salad recipe an extra squeeze of fresh lemon and a dusting of sea salt again just before serving for an extra burst of flavor.